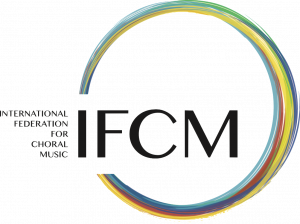 This article continues the review of choral music from Asia begun in ICB 03/2010.The internet links herein take you to score samples, audio and/or videos, and composer’s web pages. Malaysian-born musician Juliette Lai, Head of the Music Department at the Malaysian Teachers’ College as well as Director of the National University of Singapore Choir for many years, is active in the choral life of both her native Malaysia and in Singapore as pianist, singer, composer and conductor. Her arrangement of the Malay folksong Potong Padi/Rice Harvest (satb-div acap; Malay; Earthsongs), depicting the joy and celebration of harvest-time in song and dance, has been sung at many international choral festivals. For information on her scores, please contact the composer directly (juliettelai@yahoo.com). Singaporean conductor Nelson Kwei has arranged a number of Malay traditional songs including Suriram – Hela Rotan / Shuttle Comb on a Weaving Loom – Hauling Rattan (ssa acap, Malay; Edition Music-Contact 308970) and Potong Padi / Rice Paddy (satb acap, Malay; Carus 2.303). A younger ensemble, or one less experienced with international repertoire, might appreciate the arrangements of Malay folksongs by Singaporean physicist and musician, Bernard Tan. 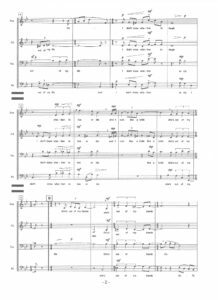 These three folksong scores, in very accessible settings for unaccompanied mixed choir, also contain helpful performance and contextual information by editor Nancy Telfer: Chan Mali Chan / Where is my Goat? (Malay; Kjos ED-872); Suriram (Malay; Kjos ED-873); Lenggang Kangkong / Swaying with the Kangkong (Malay; Kjos ED-8784). Conductors looking for a sacred Malay score can consider Karthaathi Karthar Ivarey / God of All Gods (unison,Tamil, AugsburgFortress Let the Peoples Sing v.3), a Christmas piece by D.A. Chelliah, aTamil-speaking Indian who works with Lutheran congregations in Kuala Lumpur, Malaysia.This piece is very much in the style of IndianTamil music: a unison melody over a drone, with traditional Indian tabla drum and bass ostinato.The refrain can be sung in Tamil or English; verses are in English. Founded by Genghis Khan in 1206, Mongolia is one of the largest yet one of the most sparsely populated countries in the worl d. With mountains to the north and west, and the Gobi Desert to the south, it is understandable that horses are and have been a symbol of national identity for Mongolia. We hear this image embodied in native composer Se Enkhbayar‘s vibrant score, Naiman Sharag / The Eight Chestnut Horses (satb div, Mongolian; Earthsongs), where the musical rhythms mirror that of a running horse. Taiwanese-born composer Jing Ling Tam describes her Magnificent Horses setting as a “fantasy on a Mongolian folk tune”: the text is syllabic (‘ding di li’), and the satb voicing includes an Erhu or Chinese Flute and sleigh bells (Alliance AMP-0324). Enkhbayar’s Zeregleent Gobi / Mirage on the Gobi Desert (satb div, Mongolian, Earthsongs), written for the Inner Mongolian Youth Chorus, is a reflective call to care for the environment lest it disappear as a mirage. 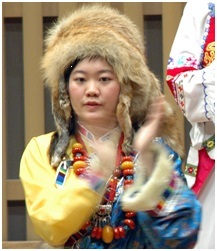 Native composer Yongrub‘s Dörven Dalai / The Four Seas (satb, acap; Earthsongs) exhorts everyone from the ‘four seas’ to raise their glasses to rejoice and sing together. 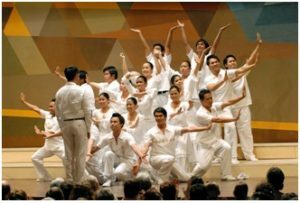 Leo Locsin dscribes his homeland’s choral culture this way, “As there are many islands that make up the archipelago, the Philippine choral scene is a melting pot bursting with the polyphony of sonic identities.” And bursting with composers. John Pamintuan (www.johnpamintuan.com) is perhaps the most prolific Filipino choral composer of his generation. In the past ten years, he has written approximately 200 scores for choirs around the world. His pieces are heard regularly in major international competitions and festivals by global ensembles. 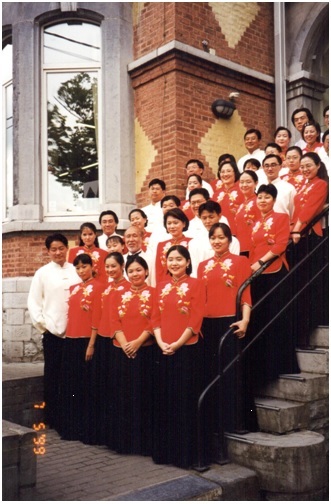 And Filipino choirs regularly program his music, including The Madz (The Philippine Madrigal Singers) and this year’s Llangollen “Choir of the World” winners The University of St. Tomas Singers. His own choral affiliations include the famed Ateneo College Glee Club in Manila, the new professional Chamber Choir of Asia, as well as the Young People’s Chorus of New York City. Many of his sacred mixed-voice Latin scores from the “Maior Caritas, op.5” collection are published by Astrum (http://bit.ly/g2Ymrm), such as his Crucifixus (http://bit.ly/h6G1aD), Pater noster (http://bit.ly/eGmAD9), Verbum caro and Regina Caelii (http://bit.ly/gOryK9). Sacred pieces for treble choir include the Missa brevis, op.4 in Tagalog, the Ama namen / Pater noster in Cuyunon, Crucifixus (ssaa div.) and Oremus (http://bit.ly/Oremus) in Latin or O magnum mysterium with guitar. John’s Filipino folk songs are a treasure: Ummah, Sallih (satb) is a traditional Molbog melody with a text from the Koran (http://bit.ly/UmmahAudio and http://bit.ly/UmmahScore). Buwa-buwa ni utu is a gentle lullaby (http://bit.ly/PaminBuwaAudio and http://bit.ly/PaminBuwaScore). His catalogue is here (http://bit.ly/PaminCat) and inquiries for scores here (j.a.pamintuan@gmail.com). Composer Francisco Feliciano is the visionary founder of the Asian Institute of Liturgy and Music. In addition to his own scores, he collected and edited AILM’s pioneering collection Sound the Bamboo, now available via GIA (www.giamusic.com). 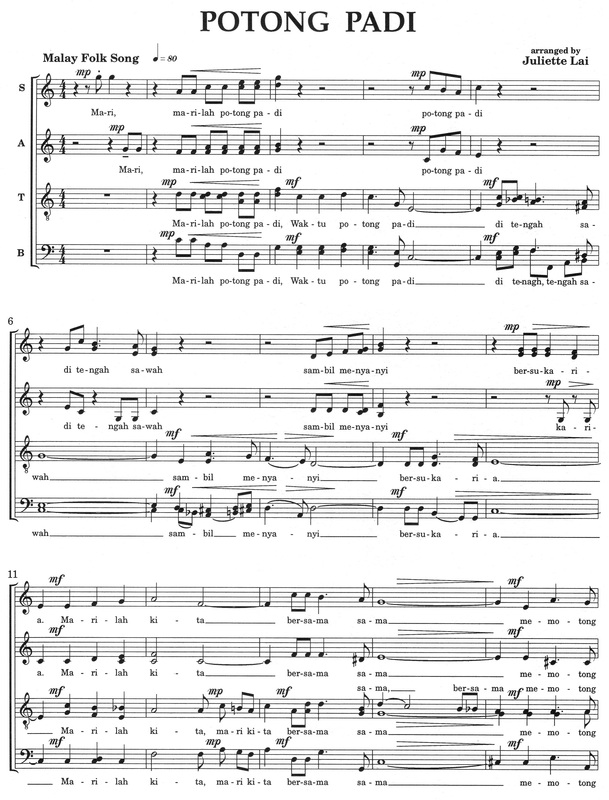 Two of his scores – Silence My Soul (satb or ssaa; gong; via AILM; http://bit.ly/SilenceMySoul) and To the Unnamed Light (any; bell; Augsburg-Fortress Let the Peoples Sing v.3) have arching melodies sung over a drone, first by a soloist, then echoed in overlapping free rhythms by individual ensemble singers. Completely different in style is his Pokpok Alimpako, based on a motif of a south-Philippines melody and the worlds of a Muslim children’s circle game (satb acap; Maranao; Earthsongs; video- http://bit.ly/Pokpok). The interlocking rhythmic patterns under the melody resemble the sound of kulintang ensembles which are similar to Indonesian gamelans. How one discovers a score and composer is sometimes just pure luck and good timing. 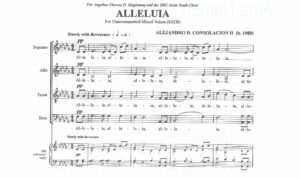 Such was the case one evening when I found a YouTube video of Alejandro Consolacion‘s gentle yet powerful “Alleluia”, written in 2002 for the Asian Youth Choir (satb div; acap; http://bit.ly/ConsolAlleluScore; video http://bit.ly/ConsolAllelu). The composer describes this score as a ” revelation…and an acclamation of hope for humankind”. Many of his other scores (satb) also capture this same spirit that just draws your ear to listen and be still. 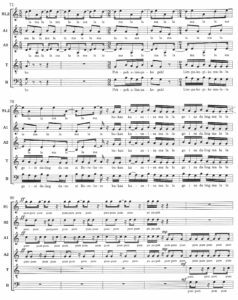 The Four Marian Antiphons (2005), Ave Verum (2004), Dona Nobis Pacem (2004), Pater Noster (2002) and Three Eucharistic Prayers of St. Thomas Aquinas (2001) are among his most well-loved and popular scores, found in repertoires of many Filipino choirs. Bio and score infos here (http://bit.ly/ConsolBio); contact the composer regarding other scores (adconz@yahoo.com). Ilay Gandangan / Beautiful Sun (satb, soli, drum; Maguindanao; Earthsongs) by Rodolfo Delarmente, director of the De La Salle University Chorale, embodies the sun chant of the Maguindanao peoples. His Dumbele is based on a dance ritual that honors the rain god, Dumbele, and depicts via choral vocables the sound of rain, from drizzle to downpour (satb, Carus 2.303; video- http://bit.ly/Dumbele). 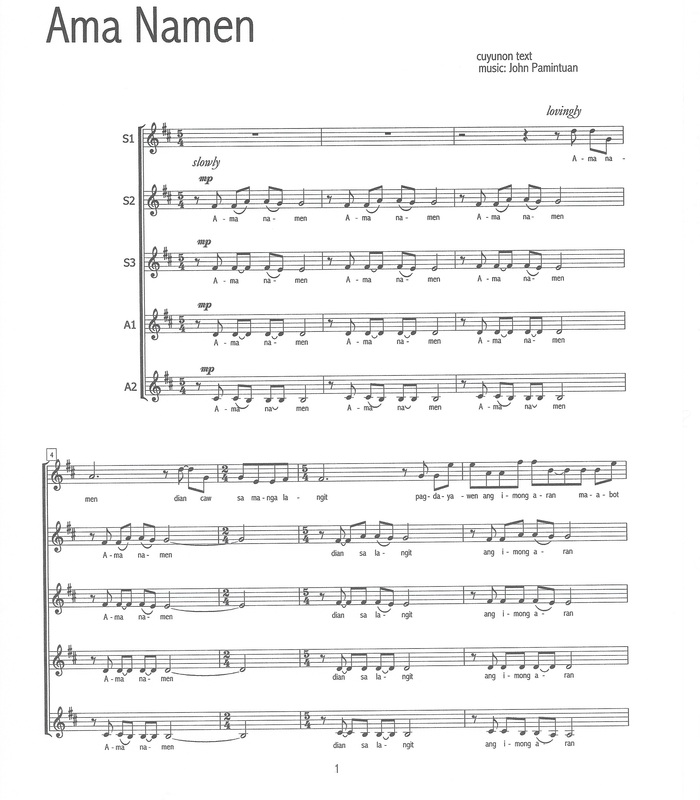 Joy Nilo’s choral scores include many sacred settings, often in Filipino (www.holymeasures.com/joynilo), suitable for concert or liturgical use. Singapore’s choral life is well represented by scores from a number of native composers. Conductor, composer and educator Leong Yoon Pin writes for both professional and amateur ensembles. A scholar at the Guildhall School of Music in London, he also studied with Nadia Boulanger in Paris. He has held many conducting positions in Singapore and is currently music arts advisor to the National Arts Council. 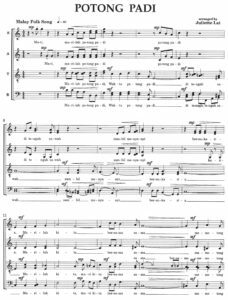 His most popular choral works include Street Calls, Pedlars and the Soprano, Like a Rapid Stream, Love Quatrains and Dragon Dance (satb, syllables; Hinshaw_HMC2001; score sample and audio http://bit.ly/hzd255). Listen online to performances of Si Nian / Nostalgia (http://bit.ly/dEMGq7) and Solitude (http://bit.ly/g84YC2) by the SYC Ensemble Singers. Zechariah Goh, former student of Leong Yoon Pin, did graduate work in piano and composition at the Univ. of Kansas (USA). He writes in both instrumental and choral idioms. 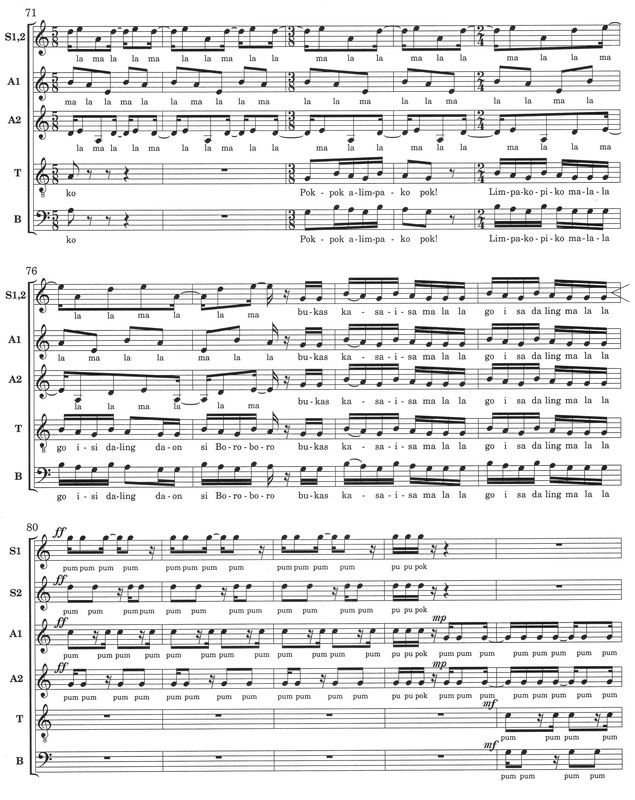 A full listing of his choral scores with information and audio samples can be found here – http://bit.ly/g45NGc Impressions (satb; Carus 2.303) uses various syllables as the text to depict the bright metallic sounds of a gamelan. Composers interesting in Taiwanese scores might consider Nan-Chang Chien‘s I am Flying (satb, SS or TT) or Diu diu dang ah (ssaa, S solo) both published by Earthsongs. Diu uses onomatopoetic sounds to imitate a train starting slowly, getting faster, and finally reaching its destination. We hear the sounds of water droplets on the train’s roof as well as the blast of the train’s whistle. Native of Taiwan, esteemed conductor/clinician nationally and internationally, and Director of Choral Studies and Coordinator of Vocal Arts at Univeristy of Texas at Arlington (USA), Dr. Jing Ling Tam also conducts frequently in Southeast Asia. Her mixed voice arrangements Jasmine Flower / Mwo li hwa (AMP0183), Flower Drum Song (AMP0323) are both published by Alliance Music. Thailand was the only Southeast Asian country never colonized by a European country. Thai musical idioms of ornate ornamentation and finger cymbals appear in Kittiporn Tantrarungroj‘s arrangement of the love song Lao Duang Deuan (satb, finger cymbals; Thai; Earthsongs) by Prince Benbadhanabongse (1882-1909). 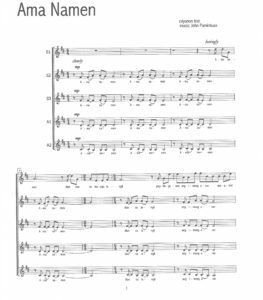 This very homophonic yet melodic score is a good starting piece for exploring the linguistics and folk stylizings of Thai choral music. 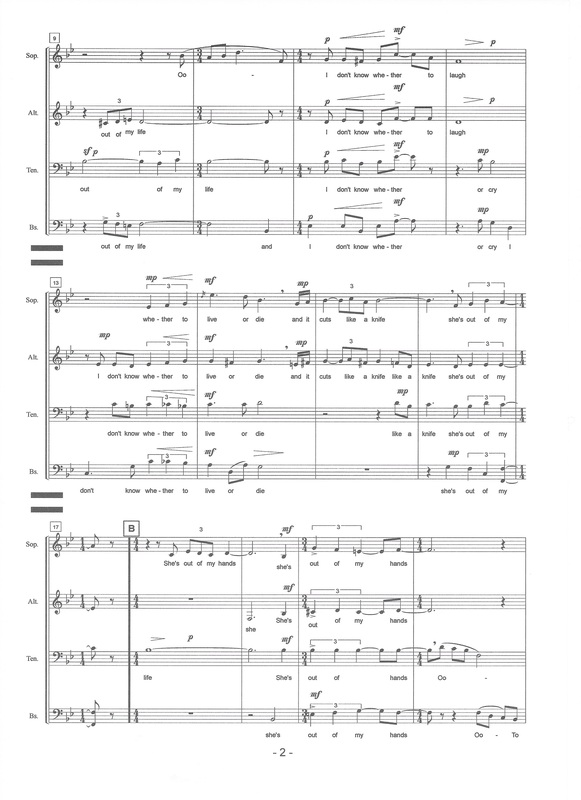 There are a number of good performances of this score online that can also serve as aural road-maps: http://bit.ly/LaoDuang1, http://bit.ly/LaoDuang2, http://bit.ly/LaoDuang3. Similar in style is Phra met ta by Inchai Srisuwan (satb; Thai; Carus 2.303) is an unaccompanied setting of Psalm 25:4-5, in which imitative entrances fall back into a largely homophonic framework. Hand drum and finger cymbals can be used throughout. Exploration of Asian repertoire by non-Asians like myself is a rather extraordinary cultural journey. Filipino conductor Joel Navarro aptly explains that we, via our music, can explore “Asian concepts of time, space, relationships and community … The West values clarity, action, confrontation. The East tends to value ambiguity, the unfolding of events on their own as a means of preserving harmony and community, and as a way of ascribing human history to the control of a Supreme Being. Events in Asia tend not to be time-specific, but function-specific—they begin when the community feels it is time to start, and they finish when the community feels it is time to end.” We, as choral musicians, have the opportunity to build bridges of understanding between cultures and countries via our shared love of singing. May the scores and composers cited in these articles be the starting point for you and your singers to explore this extraordinarily rich and diverse musical and cultural region. And may you have a wonderful journey of discovery! The author is indebted to the dozens of Asian choral colleagues, conductors and composers alike, who corresponded, recommended, answered questions and provided information for this set of articles.